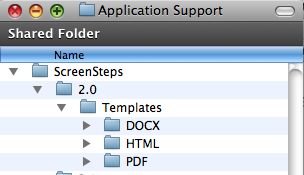 ScreenSteps allows you to customize output using templates. These templates are stored in a folder on your computer that you can access if you would like to add, modify or share them. To share a template simply send the person you want to share it with the template folder (HTML) or file (PDF and Word). The recipient can then place the folder or file in their template folder. 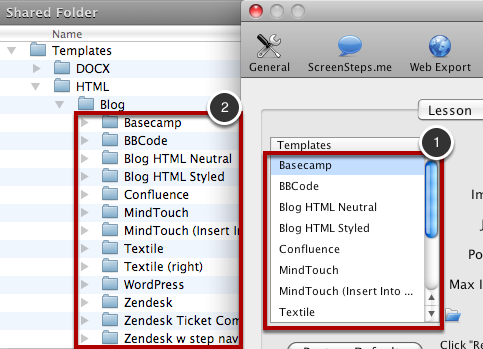 To open the ScreenSteps template folder click on the Reveal template folder button (folder icon) that appears in the HTML Templates preference pane. This will reveal the template folder for lessons, manuals, blogs or the clipboard depending on which tab you have selected when you click the button. This folder is located in your user application data support folder. The templates folder contains 3 subfolders - DOCX, HTML and PDF. The DOCX folder contains 2 subfolders - Lesson and Topic (Manuals were previously called Topics). Each of these subfolders contains template files. As you can see the list of templates in the Word Templates preference pane Manual tab (1) is generated from the list of folders in the Topic folder (2). You can add, duplicate or remove template files and they will appear the next time you export a lesson or manual or to Word. 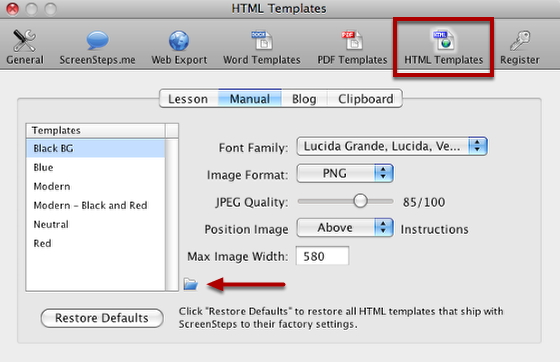 The HTML folder contains 3 subfolders - Blog, Lesson and Topic (Manuals were previously called Topics). Each of these subfolders contains template folders. As you can see the list of templates in the HTML Templates preference pane (1) is generated from the list of folders in the Lesson folder (2). You can add, duplicate or remove template folders and they will appear the next time you export a lesson or manual or to a blog. HTML templates are text based and can be customized by anyone using a text editor. 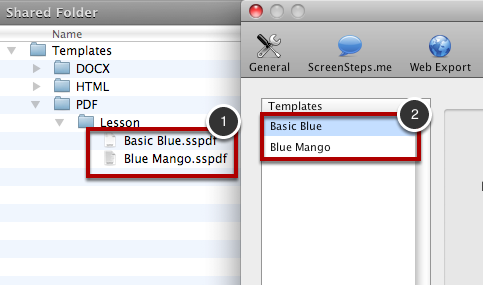 The PDF folder contains a single folder named Lesson. This folder contains the PDF templates (1) that you see in the PDF Templates preference pane (2). PDF templates cannot be modified outside of ScreenSteps but if someone emails you a template you can copy it into this folder. The template will then be available the next time you export a lesson or topic as PDF. It would be helpful if there were sceenshots of how the different templates actually appear. Yes it would Matt. We plan on including preview images for templates in a future version. Really need more power in the templating engine.... and we don't need our hands held, forget the interface, just make the markup language more powerful and documented. We can edit the files using this documentation ourselves. Work on the interface later. The .pdf templating leaves much to be desired. I'd love a template that even looks as good as the clarify stock templates with coloured header/footers for example. @David - In the next major upgrade the HTML template engine is built on PHP. You will have all of the control you want. PDF templates are HTML/CSS files so you will be able to customize to your hearts content. That is what Clarify is currently using (though there will be even more options in the upgrade to ScreenSteps).